This past week my husband was out of town. I was left all alone in the new house for 8 days. I didn't really think this would be a problem. I could get some alone time, I could work on orders, I could continue painting the walls in the house. I had stuff to occupy me. What I didn't think of when agreeing to this arrangement (Husband Guy did check to make sure it was ok to abandon me for over a week), was how I'd feel about sleeping alone. I can be a semi-paranoid person when I am left alone. My nighttime imaginations can scare the crap out of me. When I was little, I'd wake up from a nightmare and sit up in the bed. I couldn't go back to sleep because I'd scare myself into seeing a line of shadowy ants walking above the baseboard, going around my room. They were everywhere. [And no where.] My point is, that I can work myself into quite a fright. Since Husband Guy is working out of town, I'm alone in the bed, with the cat joining me periodically throughout the night. He likes to venture into the attic, so I leave the door open so he can roam up there as he pleases. What bothers me most, is that when he is under the covers with me at 3 o'clock in the morning, I hear noises up in the attic. 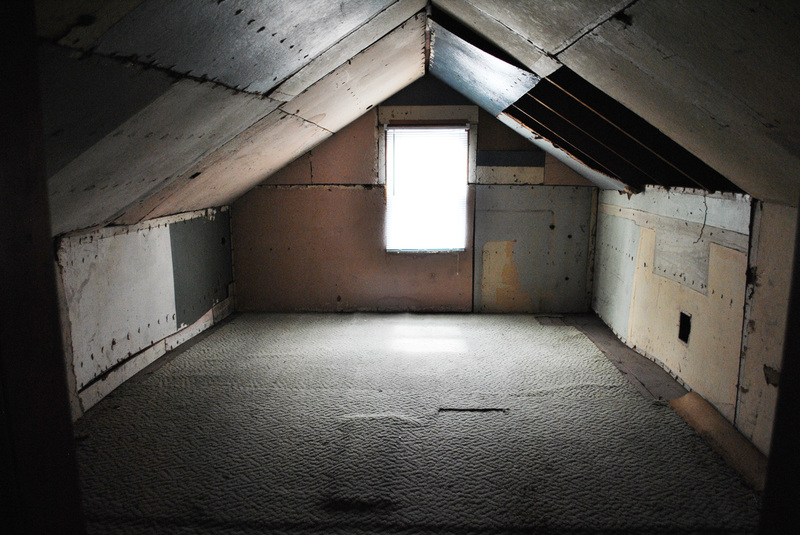 A room in our super creepy attic. I get that we now live in an old house, and old homes inherently have creaks. (RIGHT?!) However, it still scurrs me. When I am laying in bed, I can hear noises from all over the house, not just the attic. Eeek. I hope that 1.) The noises are, at the worst, friendly ghosts (and NOT EFFING PEOPLE HIDING IN MY HOUSE THAT ARE WAITING UNTIL I GO TO SLEEP TO CREEP NEXT TO MY SLEEPING FACE AND KILL ME), and 2.) The ghosts think upon me in a kindly fashion. ie. They see that I want to make the house nice and that I appreciate it and I am all alone and I'm not snooty and I brush my teeth twice a day and I try to be a good person while I'm in the house, etc. Surely, if I have such qualities the ghosts will have to be nice? I wonder at what age I will be when I am able to not freak myself out.